I have had to manage many remote teams over the past couple decades – doing so is always a challenge, even if you share a common language or culture. Add differences in those factors and you often have a huge headache for getting success out of your teams. Here are a list of the tools that I have used in the past to make these teams work and thrive. This tool by Atlassian is my strongest suggestion by far. There are many reasons to use this tool, which can be either hosted locally or used as with their SaaS offering. It is inexpensive, extremely customizable, very simple to use, cross-browser, and easily extensible – there are a huge number of third party vendor add-ons. While this tool is more focused on Agile methodology and development (particularly Scrum), it can easily be re-purposed to provide oversight for offshore projects and teams. It is not as straightforward to use as JIRA and is significantly more expensive; however, it very easily scales to enterprise-sized companies. This tool is very pretty – the interface is very intuitive. Again – this tool is mainly suited to product development projects; general IT projects will have to adapt their requirements to fit within a Scrum-based framework. This is a great tool for simpler projects or teams. A SaaS tool that is adding more feature all of the time, it is good for synchronizing understanding and files. It is outstanding in its ability to facilitate communications between team members. This tool is quite powerful and useful, but requires some setup. It is amazing in its flexibility – it can literally be set up to reflect the way any company does project management. 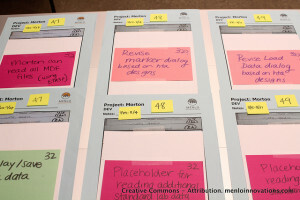 The key concept of this tool is moving cards (discrete units of work that are reflected as, not surprisingly, index cards) through columns – these columns reflect different statuses for each task, project, or chunk of work. Each card can capture entire conversations for affected parties – it used a surprisingly intuitive and powerful interface to do so. Trello is sold as an SaaS application – pricing is quite reasonable and the base features are free to use. This tool is also very good in an adjunct role with others tools – for example, I have used JIRA Agile for day-to-day product development, with Trello for specific intra- and interteam tasks, particularly for non-software deliverables. This tool is not in my top choices or even one that is ideally suited for offshore project management but most organizations will have this tool and be familiar with how to use it. Given the stress on creating small milestones and deliverables for your projects, you may be able to use it to good effect from this perspective. In addition, for showing the impact of late, missing or incomplete deliverables on your company’s project, this is the ideal tool. This is another popular and powerful tool. It essentially is a collection of small tools that all work together to provide a good collaborative environment. It requires a fair amount of customization to be useful but once this has been done, it is a great tool. Asana is best for small teams – there is a free offering for these – but the price per user ramps up quite quickly so it is not recommended for large teams. Asana is an SaaS offering. There are many other tools available for project management – some other examples are Podio and Sandglaz; I have used neither of these so I cannot comment on their utility. In any of you have had any experience with them, please let us know in the comments.